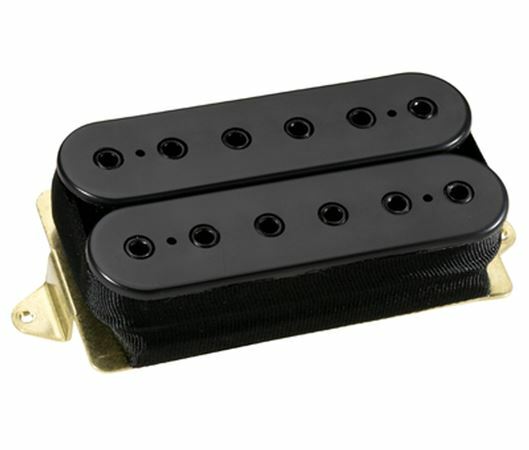 Order your DiMarzio DP271FBK Imperium Humbucker Neck Pickup F-Spaced from AMS and enjoy Fast & Free Shipping. Get the Best Deal with our Lowest Price Guarantee & Great Customer Service! The Imperium Neck Model has a very smooth, liquid sound yet it’s really tuneful. The Imperium Neck Model was developed for Revocation front man Dave Davidson. Dave’s exceptional guitar playing is difficult to categorize. It has been suggested that he be described simply as a metal player without any additional modifiers because he spans the gamut. He’s a true original, and we’re very pleased to be working with him. It was very important to Dave to have pickups that not only sound good as a lead sound, but also sound great clean because he doesn’t always play with distortion. The low end is full-bodied and the high end comes through crystal clear. He also asked that the Imperium Neck Model to be voiced as close as possible to the seven string versions, so there’s no tonal difference when he’s playing live, switching back and forth between his six- and seven-string guitars. The Imperium Neck is available in F-spacing only.